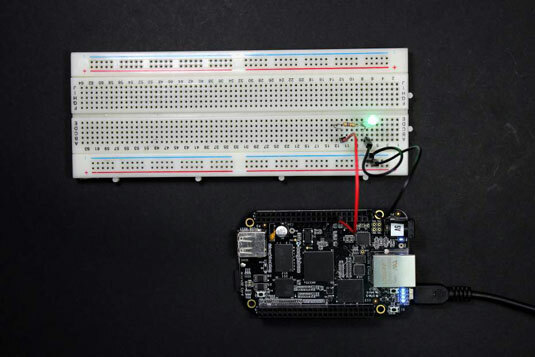 Often, the best way to get acquainted with a new working platform, such as the BeagleBone, is to light up and turn off an LED on command. To do so, you set a GPIO (general purpose input/output) as output; you want to control the state of a component. The procedure for setting a GPIO (general purpose input/output) pin as input is very similar to the technique setting a GPIO as an output. The key difference is that you read from the value file rather than writing in it. To verify this difference, you need to build the circuit shown here. To wire up a pushbutton to the BeagleBone, follow these steps and refer to the diagram for the circuit shown. Remove the power source and shut down the BeagleBoard through the command line. Power up the breadboard, and set up the ground. Using jumper wires, you can connect pin 1 or 2 of either header to the negative track — these pins provide ground — and connect pin 3 or 4 of header P9 to the positive track — these provide 3.3V. The BeagleBone pins aren’t 5V tolerant! Be careful to connect pin 3 or 4 of header P9, not pins 5, 6, 7, and 8. 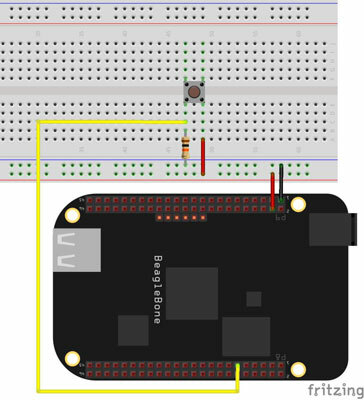 Connect a GPIO pin to the breadboard. You can use any of the pins that are labeled as GPIOs. This example uses GPIO 45, which is pin 11 of header P8. Connect it to a vertical row on the breadboard through the use of a jumper. Place your pushbutton on the breadboard. If you’re using a pushbutton, you should place it at the center of the breadboard to separate the pairs of legs. Connect one of the pushbutton’s legs to the positive rail. Use a jumper to establish this connection. Connect the other leg to the input pin. Connect it to the jumper that comes from the BeagleBone pin of the GPIO that you are using — pin 11 of header P8 in this example. A pull-down resistor is a resistor used to prevent the existence of a short circuit when the pushbutton is closed. Connect it from the ground track to the leg of the pushbutton that connects to the input pin. A 10K resistor should do the job. When the pushbutton is closed (which is the same as saying that the pushbutton is pressed), having a pull-down resistor makes the current — which follows the path of least resistance, according to Ohm’s Law — go to the input pin rather than to the ground. Thus, there is a voltage reading at the input pin.